As the sun sets you gaze at the smokey mountains and start to feel just like them - fierce and strong. You feel accomplished, amazing and in awe - and to top it off your belly is full of the delicious food provided by the Mt Leconte Lodge. The hike up to Mt Leconte lodge was the perfect challenge with views all around. You will never forget this moment. As you sit and gaze out at the mountains with some really amazing new friends you watch the clouds in constant shift. These mountains are called "smoky" for a reason. The cloud formations are in constant shift making for outstanding sunsets and sunrises. As you take the short hike back to your sweet little mountain top cabin after the sunset you are so thankful for the comfortable beds! 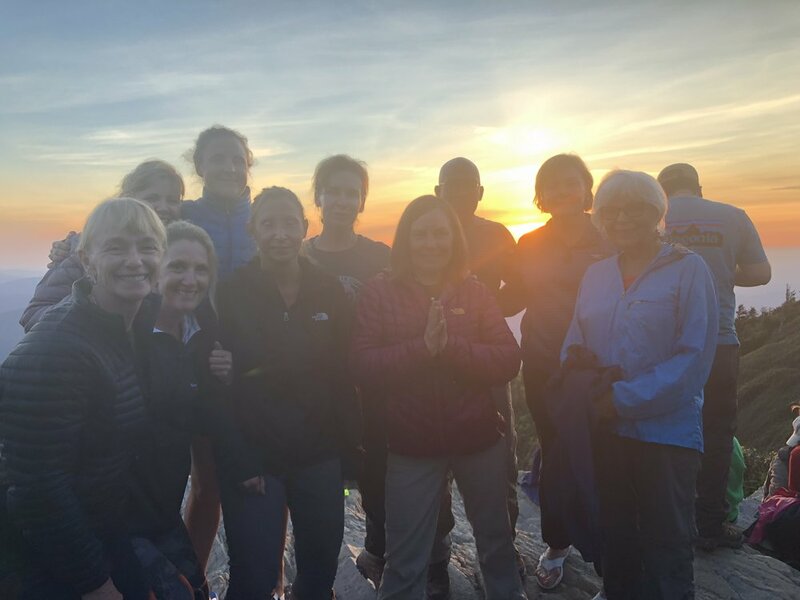 It is time to rest up so you can be ready for the short hike to an unforgettable sunrise complete with mountain top yoga & meditation. ....Challenging yourself to invigorating hikes in the Smokies, learning restorative yoga techniques that will help soothe your sore muscles as well as yoga poses that will make you feel fierce and strong. Do you want to get off the beaten path and experience a bucket list hike? We've got you covered. The hike up to Mt Leconte Lodge is totally unique, inspiring and not for the faint of heart. You will not be disappointed after you discover this gem and will feel inspired after conquering this mountain! Are you ready to step into the strength and vitality of your body? Happy to help! The hike up to Mt Leconte Lodge is not for the faint of heart. Your body will thank you for the challenge. It is a 6 mile hike up The Alum Cave trail and takes about 3 hours. You definitely need to train for this trip and Heather is happy to help. Just ask. Be prepared to carry a light day pack up the mountain. Do you want to know more about how you can feel stronger in your body & mind so you can take your fitness and life to the next level? We'll dive into this topic together! Heather will teach you yoga practices that will make you feel grounded and strong so you will have the confidence to pursue life goals that maybe once felt out of reach. Wowza! What a view! SIGN ME UP! Mt Leconte Lodge + Gracehill Bed & Breakfast - You will spend 1 day and 1 night at Mt Leconte Lodge and 2 days, 2 nights at Gracehill Bed & Breakfast in Townsend, TN which is away from the hustle and bustle of Gatlinburg. Mt Leconte Lodge sits just below the summit of the mountain at an elevation of about 6400 feet. It is one of only 5 hike in lodges, a place you can only reach on foot, in the United States. The lodge provides comfortable beds, the bedding and food which are all carried up weekly by llamas. You will need to carry a light day pack up to the cabin with PJ’s, 2 to 3 liters of water, snacks and a toothbrush. There is a magical charm about Mt Leconte Lodge. The cabins which are hand built rough hewn log cabins with propane heat, kerosene lanterns, wooden bunk beds, clean linens and warm Hudson Bay wool blankets. This is far from camping and nice to have a comfy bed in the wilderness. After the experience at Mt Leconte Lodge…. It’s time to be treated like Kings & Queens! Your jaw drops when you experience the amazing views of The Great Smoky Mountains from Gracehill B&B. 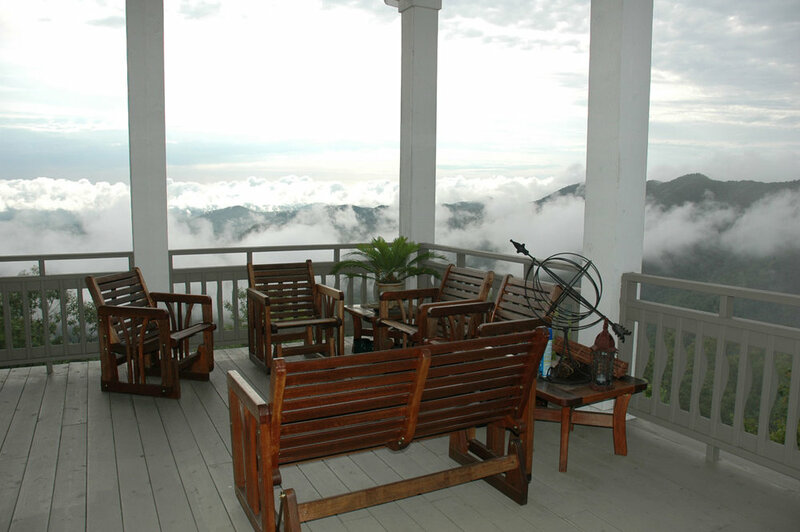 You are blown away by the truly fantastic and views as you sip a glass of wine or cup of tea. You SO deserve this! Each morning you awaken in your beautiful room, and step out onto the deck for morning meditation and yoga. It is so peaceful. Then, it is time for breakfast. You are blown away by the gorgeous table settings and 3 course breakfasts. This is the type of breakfast you sit and enjoy. Breakfasts each morning are prepared by the innkeeper, Kathy, with local and fresh ingredients. All of this pampering paired with the contrast of Mt Leconte Lodge plus the challenges of hiking is the perfect combination. You will enjoy fiercely delicious food at Mt Leconte Lodge, Gracehill B&B and one of the local restaurants in the Townsend area. 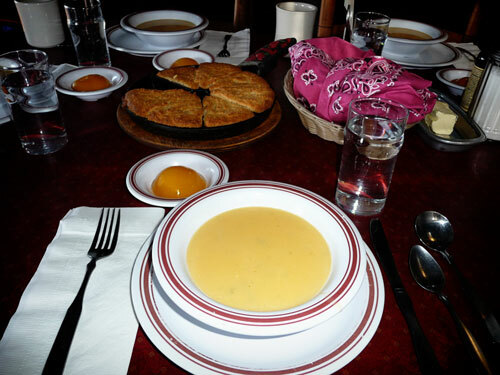 You are so hungry when you reach Mt Leconte Lodge that the hearty, family style meals are just what you crave - plus, the bottomless $11 wine hits the spot too! All dietary needs can be met! Simply let Heather know if you have any special needs. The 3-course breakfasts paired with with the elegant dining and stellar view of the smokies from the patio are so relaxing. 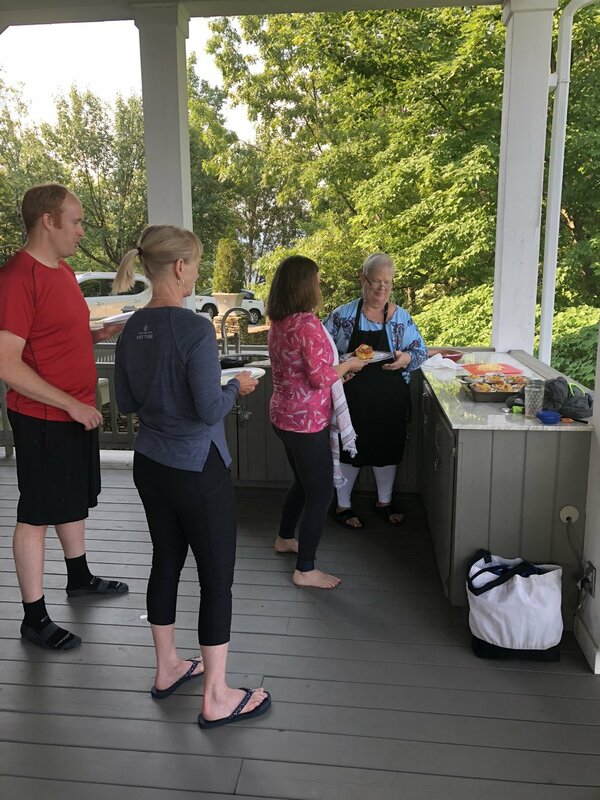 You enjoy the fresh coffee and foods made with fresh herbs from the garden, eggs from free range chickens a couple of miles down the road, handpicked blueberries from a local farm, blackberries off of the property, honey from the innkeepers brother’s hive, and veggies from the garden. We will enjoy dinner out at a local favorite, Elvira’s where you can enjoy delicious food like Blackened NC Mountain Trout, Stuffed Portabella Mushroom or Chicken Parmesan. It feels good to get cleaned up and go out to celebrate the climb up to Mt Leconte! looks so yummy! SIGN ME UP! After hiking down the mountain you will have some chill time. You decide to take a float down refreshing, crystal clear Little River in a tube. You had no idea this could be so much fun! It is the perfect way to relax, unwind and giggle as you float through the fun rapids. It is beautiful! A masseuse comes to the B&B where you will enjoy your massage. You leave this adventure feeling accomplished, strong and confident. WARNING! You will be inspired to tackle a goal you once feared pursuing OR you just may consider a new goal that once seemed out of reach. The confidence gained from the hike and new yoga tips learned bring you into your strong body and fierce self - you return home ready to flourish! You will gain an amazing new community of people who will support and encourage you as you leap into this healthier life. The people you meet on this trip will be a priceless addition to your new treasure chest! I absolutely love an active lifestyle, feeling strong & confident in my body. In my opinion, there his no other way to go through this life! I am a marathoner, ultramarathoner, triathlete, long distance swimmer, avid hiker and 500-hour trained yoga instructor. 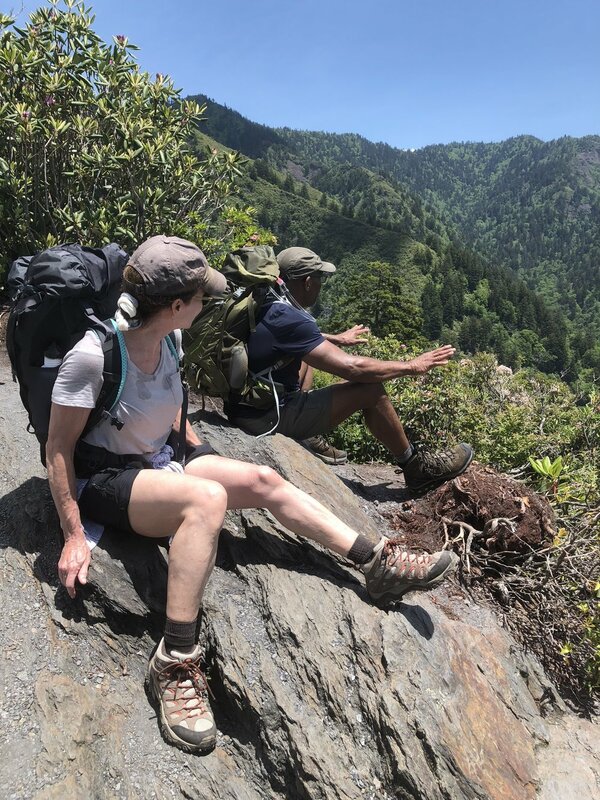 I exercised to look good, not necessarily to feel good and the hike to to Mt Leconte was one of the first experiences I had that made me realize there was so much more to fitness. I was 25 years old on a girls trip and that hike made me feel so strong and curious about more off the beaten path adventures I could conquer. That trip began to shift my mindset about health and fitness from one of doing it to be “skinny” to doing it to be healthy and strong. It felt like a much healthier approach. I can't wait to share with you two of my biggest passions - hiking and yoga - with you so you can see how they will inspire you to love your fierce, strong body too. I went to Mt Leconte for the first time in 2005 and it inspired me dig deeper and go further with my fitness. I remember climbing to the to and feeling so strong and powerful. I felt like I could do anything! I can't wait to share this fairy tale like place with YOU. I know when you strike a warrior pose on the top of Mt Leconte you will feel like you can accomplish anything you put your mind to. Yes, Heather! I am ready to be fierce and flourish!